I’m currently running two wonderful contests on my facebook page. 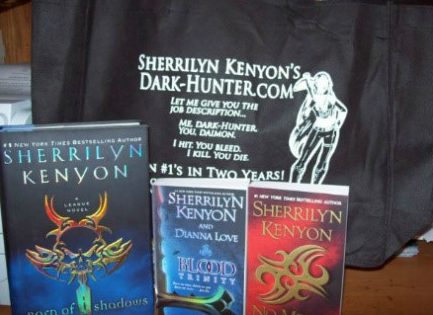 The first gives you the chance to win the Sherrilyn Kenyon prize package and gift bag tote you see at the top of this blog. To enter, simply go to my facebook page and follow the instructions. Guest Author: Barb Meyers & Giveaway! Great – I should certainly pronounce, impressed with your website. I had no trouble navigating through all tabs and related info ended up being truly easy to do to access. I recently found what I hoped for before you know it at all. Quite unusual. Is likely to appreciate it for those who add forums or something, site theme . a tones way for your client to communicate. Excellent task. Needed to write you the little word to be able to thank you very much again for your incredible basics you’ve documented on this page. It is simply surprisingly open-handed of people like you giving openly what many individuals could have made available for an e-book to help make some cash for their own end, mostly now that you might have tried it if you ever considered necessary. Those things as well worked like the great way to know that some people have a similar dreams really like mine to learn great deal more in terms of this matter. I am certain there are lots of more fun moments up front for individuals who discover your site. Simply wish to say your article is as surprising. The clearness on your post is just cool and i can suppose you are an expert on this subject. Fine along with your permission allow me to grab your RSS feed to keep updated with coming near near post. Thank you 1,000,000 and please continue the enjoyable work.